Fork offers the fastest way to execute Android instrumentation test suites. Flakiness Reporter produces readable reports about test flakiness on tests suites previously executed by Fork. Chimprunner runs performance tests and keeps stats and standard reports (Systrace, memory, CPU, etc). When running instrumentation tests, there is a significant time overhead for developers, especially on larger test suites. Existing solutions were not satisfactory for quick feedback before pushing code to VCS and for CI purposes. We are big fans of Spoon and were using it for our plans, so we used it as our starting point. However, Spoon had similar issues to the Gradle and Maven test execution plugins, in the sense that it executes all tests on all of the connected devices (and emulators). We decided to tweak that naive scheduling to achieve much faster test execution. infinite scaling: your tests can speed up by as many devices and emulators as you can dedicate to your CI box. because test suites now get scheduled to run on a pool, not all tests will run on all devices. For that reason, we also introduced a way to create a pool per device, which offers full coverage (a.k.a. Spoon-mode) but typically takes longer, so we run it on a nightly basis. Fork works out-of-the-box, without any code changes. There are two ways to run Fork with your builds. First, you need to add a build-script dependency. You can have access to snapshot builds, but stable versions are recommended. title = "My acceptance tests"
Note: The testPackage property refers to the base package name which your tests reside in. If you have tests in multiple packages, provide the most common ancestor. --sdk                       Path to Android SDK. Defaults to the ANDROID_HOME environment variable. --apk (*)                   Path to application. --test-apk (*)              Path to test application. --config (*)                Location of the configuration file. The properties of the configuration file are described in: Configuring pools and runtime and related Examples. One of the most useful characteristics of the library is the way it creates the device pools. There are different options, to automatically create pools by API level, shortest width dimension and whether devices are self-described as tablets. On top of that, users can also manually create pools based on serial numbers, for maximum flexibility. eachDevice boolean create a pool per device (a.k.a. Spoon-mode). This is the default behaviour. //in here RECORD_AUDIO and ACCESS_FINE_LOCATION are *not* granted. After every test case, all the runtime permissions will be automatically re-granted even if the test fails. This feature will impact only Marshmallow and subsequent devices. Using Fork you can set metadata on tests and get them back in its JUnit xml reports. The metadata are added as additional property tags on the suite level of the report, as each test produces its own report. Note that Fork will stop adding pairs after it encounters an unpaired key or value, so make sure you have the same number of keys and values. subtitle "automatically split phones to large tablets"
The above will run tests on 2 pools, one named "phablets" and another called "tablets". The smallest width for the first pool will be 0 and for the latter 720 dpi. That will create three pools named "phablets", "tablets" & "emulators" with devices that have the respective serial numbers. Emulators will be selected automatically by a regexp. The scheduling still works on a single build box with ADB, so there still is a limit by how many devices & emulators can be simultaneously connected to ADB. Eventually, Fork could be tweaked to talk over HTTP with other build agents, that would then be connected to devices over ADB. That model would tie in nicely with multi-agent CI systems, like Jenkins. One common problem with UI tests is the test flakiness from either the environment they run on or badly written tests. To help track down tests that are misbehaving, we introduced the Flakiness reporter. The reports produced by the Flakiness Reporter eventually make it trivial to find flaky tests and link to them and their diagnostics. Currently Jenkins is supported and it should be really easy to extend it to other types of CI servers. The Flakiness Reporter collects Fork output files, matches test runs over previous builds and sorts them according to their flakiness. Links are also created to each test of each test run, for easy navigation to diagnostics. The Gradle plugin that allows the Reporter to run can be applied to a standalone project, since it doesn't directly depend on your Android project. For convenience, however, that is a good compromise. Currently, the Reporter supports Jenkins but plugins can be written to be used with other CI servers. You can easily execute the Reporter with the following command. reportTitle = "My project's awesome flakiness report"
In your post-build action section in Jenkins, do the following two actions. This requires Jenkins's HTML Publisher Plugin. To be able to link to the right test runs, use a clear title. Note: The forkJenkins.jenkinsReportTitle parameter of the gradle configuration has to match the Report Title added here. At the time of writing, not much is available around automated performance testing. Chimprunner is a very simple test runner that allows recording of somewhat accurate timings on test execution, from process creation to test finish. 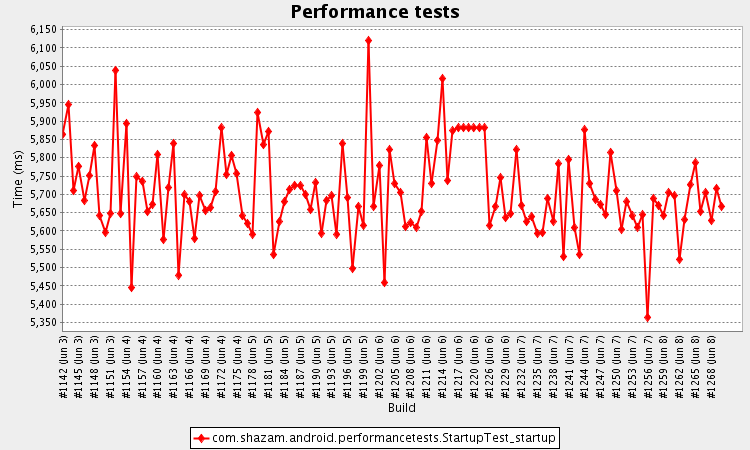 It all works on the Android instrumentation tests system that developers are familiar with. The system could then provide a systrace & GPU profiling reports for the duration of the trackListScroll() test. Copyright 2016 Shazam Entertainment Limited.